ISAs are a great way for residents in the UK to save, or invest, up to £20,000 tax-efficiently every year. Also known as an investment ISA, a Stocks & Shares ISA allows you to invest your money in assets such as shares, bonds, property and commodities. You don't have to pay any tax on capital gains or income, meaning you can keep everything you earn from your investment ISA after fees and charges are taken. You also don’t need millions of pounds or to be a London trader to invest in a Stocks & Shares ISA. 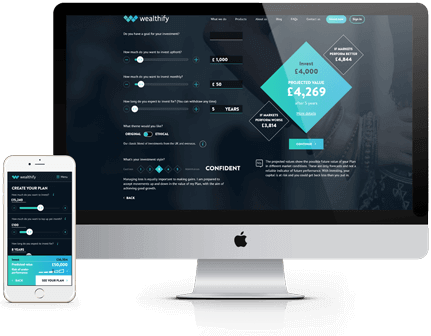 In fact, you can start with as little, or as much, as you’d like – Wealthify has no minimum investment requirement. When it comes to investing, there are two ways you could go about it. You could decide to invest yourself and be in complete control of your own investments. Or, if you’d prefer the help of an experienced professional, you could use a digital service that does the hard work for you. You’ll need to decide which provider is right for you, how much and how often you want to invest, and your risk appetite. Shares form part of the four main investment types, along with bond, property and cash. There are two main types of adult ISA: Cash ISAs and Stocks & Shares ISAs. Lifetime ISAs and Innovative Finance ISAs may also be options for you, depending on your circumstances and goals. Each year, you can pay into one each of these as long as you don’t exceed your annual allowance of £20,000. You can even split your allowance between the different types of ISAs, for example, investing £5,000 in a Cash ISA, and £15,000 in a Stocks & Shares ISA. Robo-investing, or robo-advice services are predominantly aimed at helping people with little or no previous investing experience, by taking most of the effort out of investing. Investment ISAs can seem quite daunting for first-time investors, but with these new services, you don’t have to be a financial wizard to invest in stocks and shares. Robo-investment services let you choose the level of risk you want to take then pick the most appropriate investments for you. Many Robo-investment apps, like Wealthify, have a dedicated team of experts on hand to monitor markets and manage your investments on your behalf, adjusting them when necessary. How much you’d like to invest: there is no minimum investment and you can opt to make regular deposits by Direct Debit instead of a one-off lump sum. What style of investing you'd like to take: cautious, tentative, confident, ambitious or adventurous. Each style is explained in more detail to help you choose. What your goal is: although your money is not locked in at all, it’s good to have a long-term goal of five years or more to aim towards. This will help keep you focussed if in the short-term your investments go up and down. Investing is effortless when you choose Wealthify. Simply pick what type of investor you would like to be. Are you cautious, adventurous or somewhere in-between? We will then build your Personal Investment Plan and monitor your plan all year round, adjusting it accordingly to keep everything on track. You can use our investment slider tool to discover how much your money could grow when you let Wealthify invest for you. It is important to understand that these predictions are only forecasts and aren’t reliable indicators of future results. If you have any Cash or Investment ISAs with other providers, you can simply transfer them over to a new provider. If you have a number of Investment ISAs in different places, you will be paying a fee to each provider. You could save money, and peace of mind, if you transfer your money to one place. To transfer your ISA to Wealthify, you’ll need to fill in an official ISA Transfer Form to retain your ISA tax benefits.